Here's the Sauerbraten recipe that comes from my Mutti's own handwritten cookbook. Her recipes are special to me. Full of wonderful memories, especially sitting in the dining room, enjoying these delicious feasts. This beef dinner is one of those. The meat is so tender and flavorful. And, it's so easy to make, especially using a slow cooker. Using the slow cooker makes this tender marinated meat ever more tender. It's a traditional German dinner and still is a favorite. 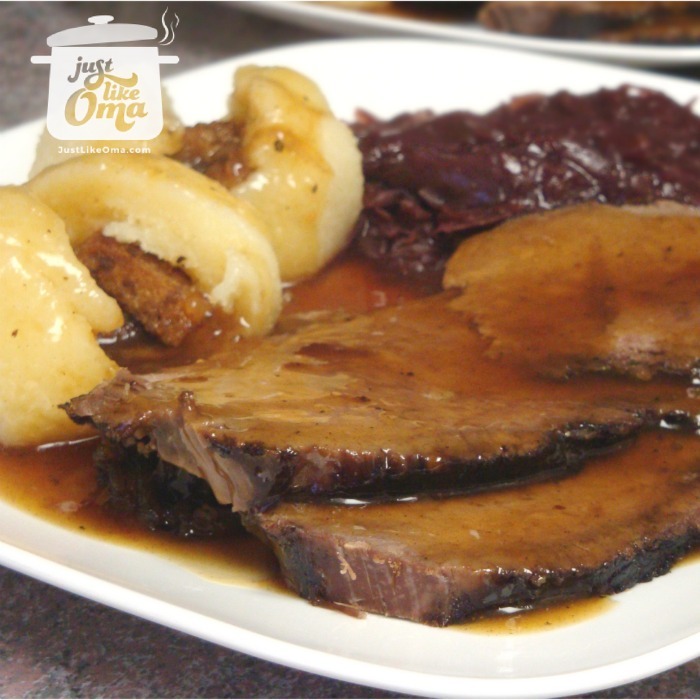 For another sauerbraten version, try Jodie's German Sauerbraten that's posted below my Mutti's. OR, check below for a really quick sauerbraten, using a pressure cooker! Wipe meat with damp cloth and sprinkle with salt and pepper. Place in ceramic or glass bowl (not metal) or into a Ziploc bag that's been placed into a bowl in case it should leak. Add vinegar, wine, bay leaves, peppercorns, cloves and one sliced onion. Add water to cover. Tightly cover bowl (or seal Ziploc bag) and refrigerate for 3 - 5 days, turning once or twice every day. In Dutch oven or deep pan, put about 2 - 3 Tbsp bacon fat, butter, or oil to brown meat. Brown roast on all sides. Add carrots, onions, and celery. Brown slightly. Remove meat. Mix corn starch with a bit of water. Slowly add just enough to simmering cooking liquid until thickened for gravy. Remove from heat and stir in sour cream (if using). Season with additional salt and pepper if needed. Serve meat and gravy with potato dumplings and red cabbage! Makes 8 - 10 servings. For a 'spicier' taste, remove meat from marinade the night before cooking and cover all sides thickly with mustard. Cover and continue the following day with above instructions. In a large plastic tub with a lid: Wipe meat with a damp cloth. Place the roast in bowl and prepare marinade to be poured into the same bowl. Prepare the first 10 ingredients mix together and pour over the meat. Put lid on good and tight so no air can get to it. Place in a cool place and marinade for three days, turning the meat 2 to 3 times a day. On the third day, (day of the meal) remove the meat from the marinade and wipe it dry. Heat marinade in small pan. Heat dutch oven slowly, add cooking oil. Dredge the roast in the 2 Tbsp flour, salt and pepper mixture. Brown well, add in marinade, cover and simmer for 2½ to 3 hours. Strain Marinade and skim the fat, measure 3½ cups of the marinade into a pan and heat. In a small jar measure ½ cup water, the rest of the flour and sugar, place lid and shake till there are no lumps, slowly pour into marinade stirring all the while, bring to a boil, add crushed ginger snaps to the marinade, bring back to a boil stirring constantly. Strain marinade through cheese cloth so that it is smooth. Pour over meat and simmer 20 minutes covered. Remove from heat slice roast, serve with potato dumpling use the gravy you made from the marinade over the meat and dumplings. Fantastic! 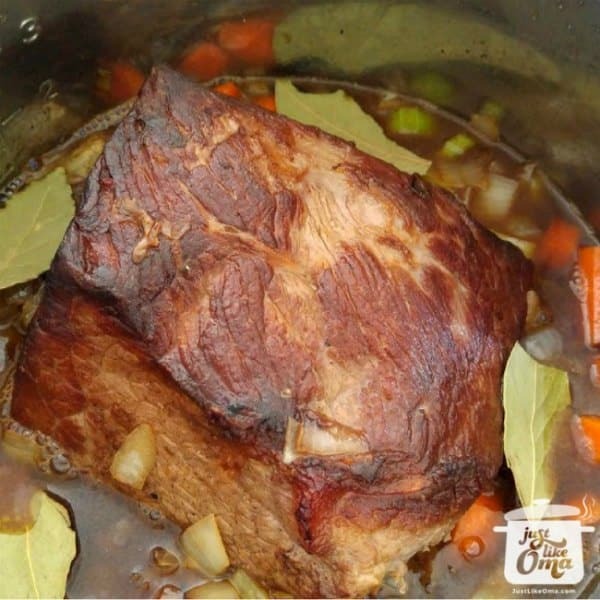 German Sauerbraten is so easy to make, but it's NOT quick ... it takes time to marinate and to cook. It just means that you need to do some planning to allow several days for the marinating to take place. But, it's SO good and SO worth the time. The results are worth the time. The marinating time is anywhere from three to five days. During this time, all you need to do is turn the meat once or twice in the marinade. 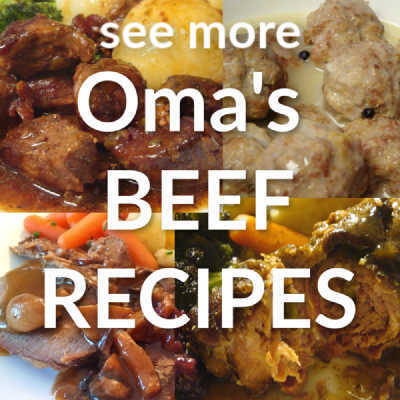 Once you're ready to cook the meat, you have a choice of doing it on the stove top or in the slow cooker. Personally, I like using the slow cooker since it's something I can leave on the counter and go shopping. You still need to go through the browning of the meat. Then just put the vegetables and broth (or water) in the slow cooker, along with the meat. Just about to seal the Instant Pot pressure cooker and have dinner ready in 1 hour. Wunderbar! Just got a craving for Sauerbraten. It's 4 o'clock? Follow my recipe for making this in an Instant Pot pressure cooker and you'll have a complete meal on the table by supper. "Wisdom is enshrined in an understanding heart; wisdom is not found among fools." 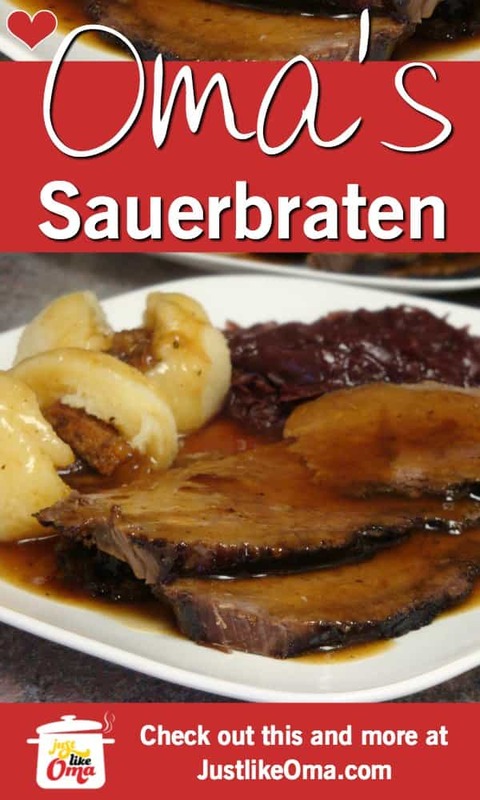 This German Sauerbraten recipe comes from my Mutti's own cookbook. Tender and flavorful, this traditional beef dinner is for sure a favourite. As a German-American that is a bit culinarily challenged, this book is a true blessing! What makes this book extra wonderful is that the recipes are separated by region. German food is more complex than bratwurst, sauerkraut and pretzels! 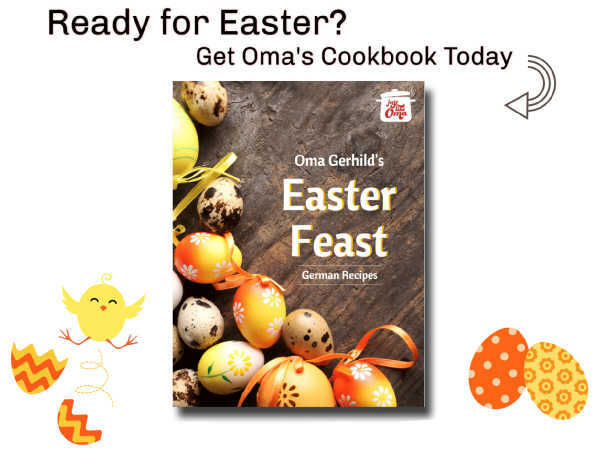 This classic cookbook (German Meals at Oma's) has not only a variety of different recipes, but also key notes to help even those with little experience in the kitchen learn to make excellent German cuisine. It was a real pain going through this eBook! The photos are so ‘tasty’ looking that I spent considerable time looking at each photograph. So it took a really long time to go through the entire book. The photographer and the book designer have done an excellent job. There really seems nothing to criticize about this book. Tried hard, but I really liked everything. Congratulations once again on a great publication. Gerhild takes us on a culinary journey across Germany through her thoughtful selection of regional dishes, with helpful tips and anecdotes along the way. Your eBook – WOW. It is excellent. Great write-ups, great layout, great pictures, colours, everything!! ... In summary – WOW – great job. Love it and I will be making most, if not all, of these recipes. Debra W. says, "We will be having this tomorrow night for a GERMAN FEST ... Yummy." Brenda S. says, "Thank you. I have been looking for this for a long time. This is an awesome cake." Isabelle M. says, "Wow! I made this last night and OMG what a delicious meal! With red cabbage it was just amazing. Thank you! Will certainly do this again and the sauce just adds so much flavor to the dish."